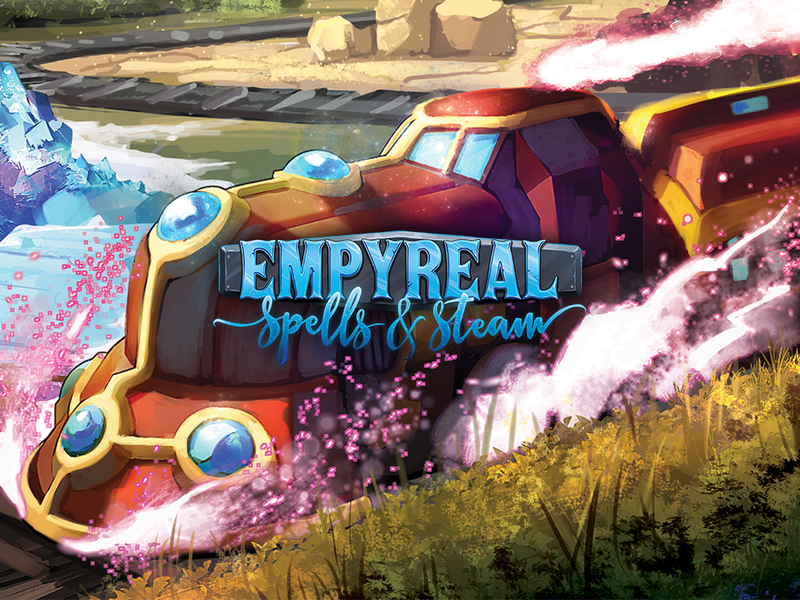 Empyreal: Spells & Steam is a rail-building board game for 2-6 Players, and plays in about 20 minutes per player. It is a perfect introduction to the rail-building genre, but also holds unique twists for longtime fans looking for something outside of ordinary rail-building fare. Empyreal is designed by Trey Chambers and illustrated by Nokomento, the same dynamic duo behind Argent: the Consortium! New advancements at Argent University have brought Technomancy, a fusion of magic and science, to the forefront of everyday life. Now the race is on to secure the resources needed to power these modern machines and to connect the far corners of the continent. Regional governments, private companies, and foreign interests have all come to the eastern capital, Kor Karoli, in hopes of building a transcontinental railroad that will reach the resource-rich capital of the western desert lands, Empyreal City. With your accomplished team of technomancers at your side, you will lay railroads to create a trade network that spans the continent. As you complete deliveries, new advancements in technomancy will allow you to build faster and better, racing your rivals for precious resources and delivery contracts as you work to connect the world. Leverage the magic and resources at your disposal to carve a path across the continent and control the future of world trade in Indines! Empyreal presents fluid, engine-building gameplay as you customize your railyard with new engines and upgrade your company with unique specialists. 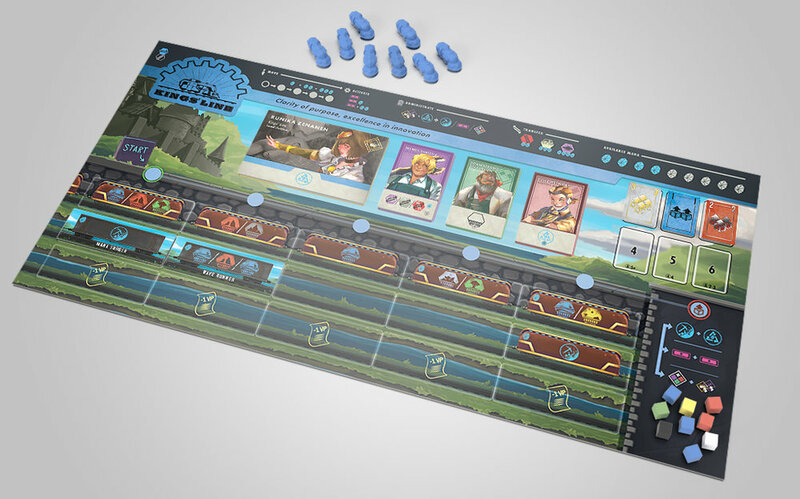 In each game, you will customize your company and carve a different trail through the varied terrain of the world. Outwit the machinations of your competitors to become the most prestigious railway company in the world! Empyreal is a game that is deep enough for skilled players to enjoy again and again, but simple enough for novice gamers to learn and start playing in only a few minutes. We would call it a 'gateway game with depth'! Each rail company offers different starting spells and different terrain advantages. Dryads build more effectively through forests, while the Daemons and their ghost-trains weave their way across the continent, sowing confusion in their wake. Build with elemental magic, forgotten ancient technology, and even alien assistance from other planes! Build quickly to connect cities and maximize your options for delivery. 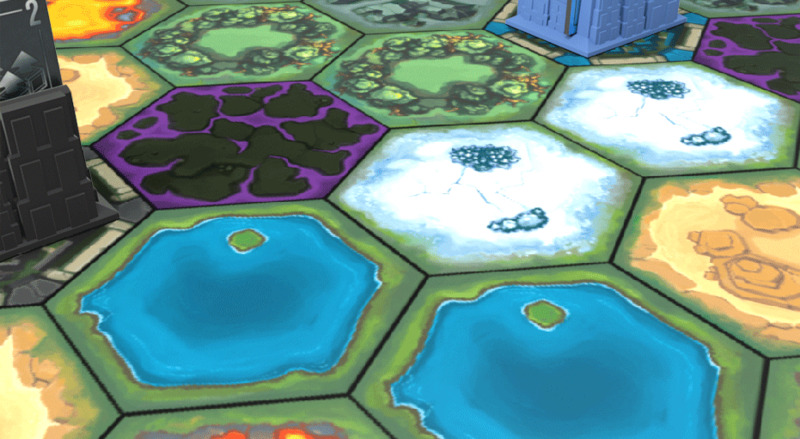 Only the first person to deliver resources to a city can claim them as points, and only the first person to meet a city's demands can claim its contract as a bonus. Beware of opponents who build into your territory or position themselves to make deliveries into your cities!